Lagos Nigeria, August 31st, 2018: The Chief Executive Officer of Caritas Group, Adedayo Ojo, has said that the challenges of product quality, communication, reputation, perception and packaging affecting Made in Nigeria brands can be resolved with proper policy formulation, strategic direction and effective communication. 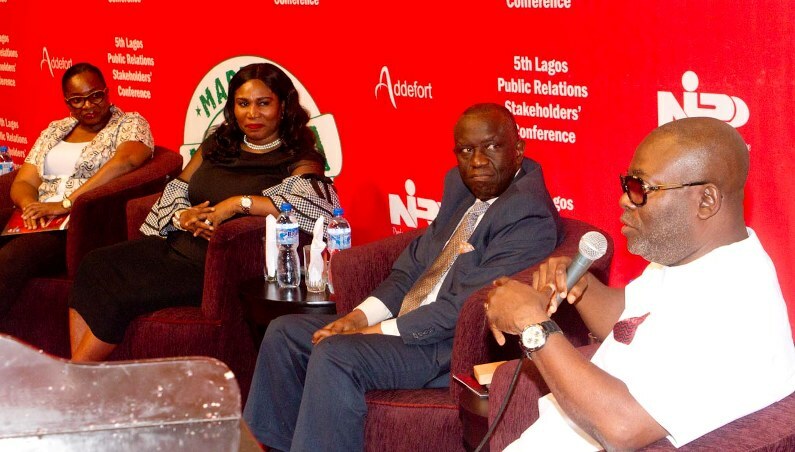 Ojo stated this while moderating a panel session at the 5th edition of Lagos Public Relations Stakeholders’ Conference organized by Lagos chapter of the Nigerian Institute of Public Relations (NIPR), themed “Addressing Communication and Reputation Challenges of Made in Nigeria” in Lagos. Ojo encouraged Nigerians to patronise and consume made in Nigeria brands. “I am going to be the change. I will patronize made in Nigeria brands. All of us have a role to play as citizens. Let us defend everything that is Nigerian made”, he said. Earlier in her presentation, Chief Executive Officer, Emerging Africa Capital Group, Toyin Sanni, emphasized the need to market Nigeria first before marketing Made in Nigeria brands. She added that positive perception and reputation of Made in Nigeria brands must be effectively communicated. “We need to market Nigeria first before marketing our brands. Communication is everything – it is a differentiator that shapes reality and power. Communication shapes reputation better. A better business is the one that can communicate what they do, truly project their clients and engage in strategic direction,” she said. Sanni further called on government at all levels to articulate a clear strategy to package and communicate the brand ‘Nigeria’ appropriately. She added that public and private sector partnerships should be encouraged in positioning Nigeria while models to repair the nation should also be established. In her address, the Lagos State Commissioner for Commerce, Industry and Cooperatives, Olayinka Oladujoye, who was represented by Ayo Abiodun said Lagos State has always been at the forefront of made in Nigeria brands by facilitating various Medium and Small Scale Enterprises (MSMEs) initiatives that boost local production, create jobs and contribute to the national economic growth and the GDP.